If building a sturdy business can be compared to a magic trick, Grand Illusion Hard Cider is the bunny pulled from a hat full of dedication and hard work! 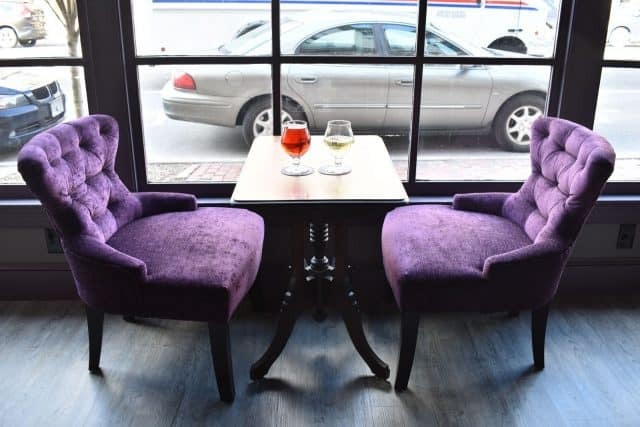 Located in the historical district of Carlisle, Pa. (about 25 miles west of Harrisburg), Grand Illusion Hard Cider is an urban cider bar creating some buzz since its grand opening in late February of 2018. What started as a whimsical idea by owners Chad Kimmel and his wife, Andrea, has evolved into a brick-and-mortar that is receiving positive reviews from the community. Born and raised in Levittown, Pa., Chad Kimmel has a Ph.D. in sociology and has been a professor at Shippensburg University for 15 years. Craft beverages have been a passion of Kimmel’s, and he felt compelled to share his love of cider with a community that hadn’t yet developed a craft cider scene. His vision started in 2009, and after years of education at Penn State Extension program and plenty of research, he began producing of his own cider. 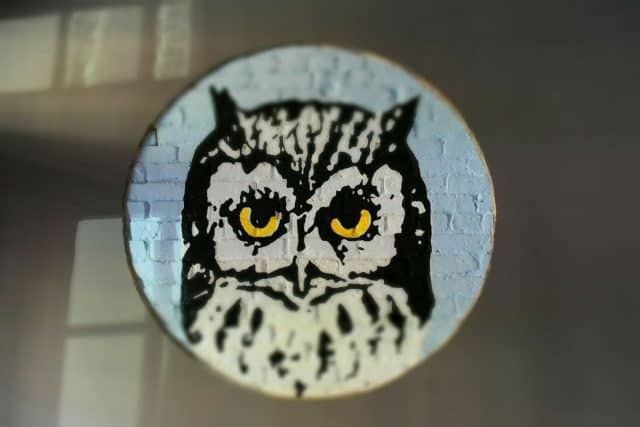 Walking through the front doors at the Grand Illusion cidery, guests are greeted by the mural of the cidery’s logo, a very serious-looking owl, that oversees the ground floor’s main bar which is made from reclaimed doors and is illuminated with magician hat lights. Across the building’s hardwood floors — original to the 19th-century structure — are stairs that lead to the second-floor bar, a steampunk lounge complete with six cider taps and two wine taps. Inspired by turn-of-the-century magic, Grand Illusion’s atmosphere is laced with a funky flare and nods to times past. 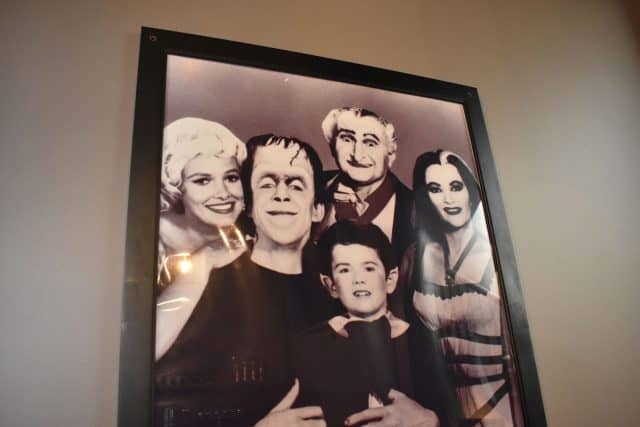 From the wall art, including a poster of The Munsters, to other fun details (like the secret door that leads to a hidden bathroom! ), every aspect of the cidery’s layout references its whimsical concept. While it takes a bit of magic to bring any vision to life — especially a bar or restaurant concept — the real magic lies within the people working there. Understanding this, Kimmel assembled a staff of people who fully support the idea of bringing craft and quality to an uncharted area. Education is important to Kimmel and he encourages his staff to be equally educated in the art of craft cider. Staff members are encouraged to complete Level 1 of the CCP exam from the United States Association of Cider Makers. Kimmel’s goal is to help customers walk away from the experience of Grand Illusion feeling educated, and it seems to be working. “[Our] customers have been really receptive to the cider bar concept,” says Kimmel. The reception may also have something to do with the quality of the product. 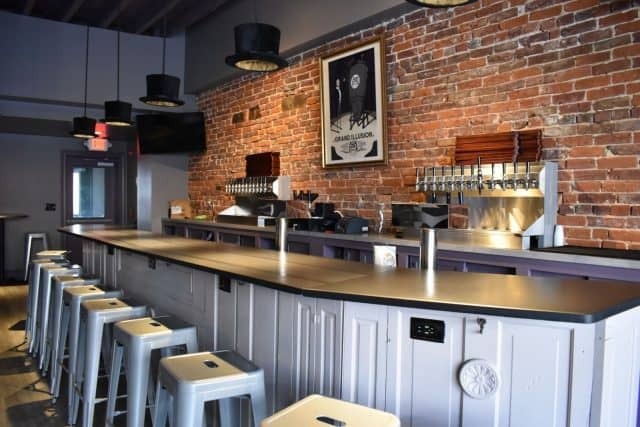 Kimmel wanted to include many aspects of the craft beverage trade into his vision, thus his bar features 15 hard ciders, five craft beers, six Pa. wines and craft cocktails made with Pa. craft-distilled spirits. Flight boards are the highlight of the Grand Illusion experience. Guests can choose from the array of beverages on tap to create their very own sampling session of six drafts, all of which pair well with choices from the food menu. Try a flight of pretzels, complete with salted, spicy Cajun and Italian herb-rubbed soft pretzels, accompanied by a trio of dipping sauces. Or dive into one of the cidery’s bubbling hot flatbreads, such as the three cheese with roasted garlic, tomato and artichokes. The art of the industry is all about the challenges. “This is a challenge; a personal achievement,” says Kimmel. April celebrates the arrival of Grand Illusion’s first cider — previously, the bar had just been serving cider from other local cider makers like Kurant, Big Hill and Frecon’s. Its first release, Blue Illusion, is a blueberry lavender cider, available on tap at the bar and for takeout via six-pack. It was made on-site at Wyndridge Farm in Dallas, Pa.
Community engagement is also an important aspect of Grand Illusion. In keeping with the cidery’s mystical theme, guests can enjoy Magic Mondays, where magicians perform family-friendly table magic, hosted every Monday evening at 6 p.m., now through July 30. For more on Grand Illusion’s upcoming events, visit its Facebook and Instagram pages. 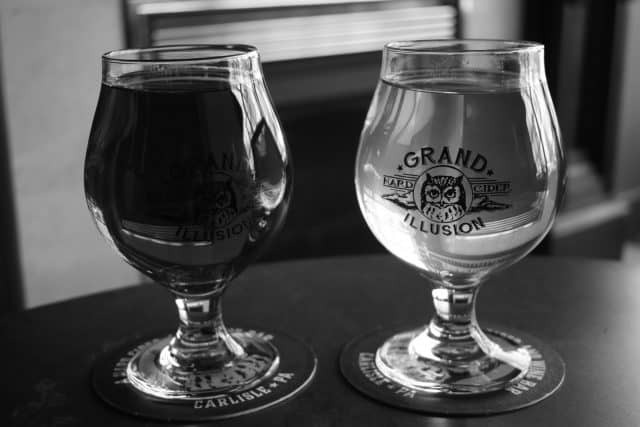 Grand Illusion is open Monday through Thursday from 4–10 p.m., Friday from 4–11 p.m., Saturday from noon–11 p.m., and Sunday from noon–7 p.m.
Grand Illusion Hard Cider is located at 26 W. High St. in Carlisle, PA; phone: (717) 462-4716.